One of the favorite candies in our house this time of the year is candy corn. It is so colorful and fun and says fall in a sweet tooth kind of way. These cookies and cream candy corn truffles are the perfect size for a sweet bite of fall fun. 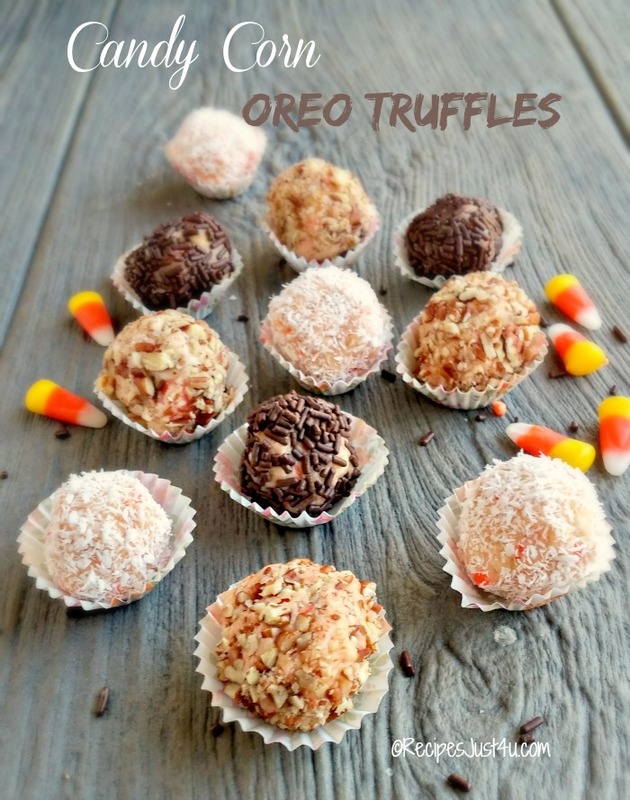 It’s time for the holidays with these cookies and cream candy corn truffles. And also check out these Red Velvet Cheesecake truffles. They are perfect for Valentine’s Day or Christmas. I try to stay away from candy most of the time. It does not agree with my hips in any way shape or form. I also find that too much sugar just plays havoc with my immune system overall. But during the holidays, all that changes. I turn into a little kid and try get my fix for the next year and then some. Not very adult of me, but what’s a girl to do? I’ll pay for it in January, but I do enjoy the next few months. 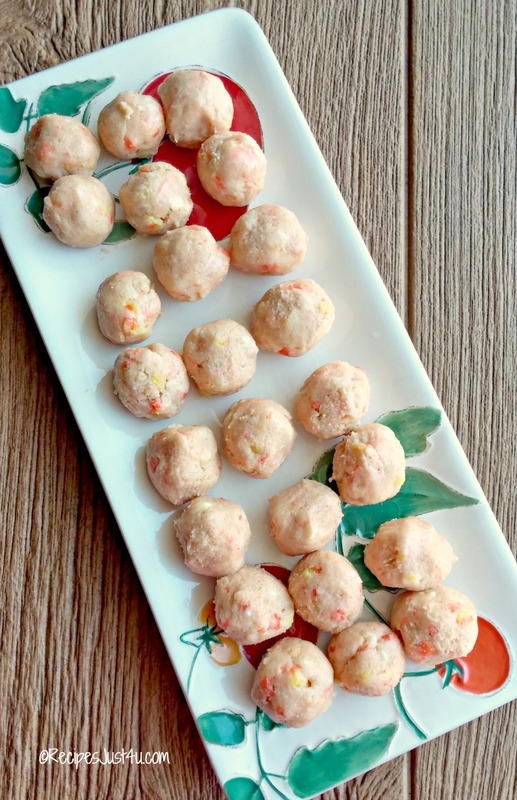 The recipe for candy corn truffles is very easy to do. Basically, it is a lot of chopping, and rolling and a bit of cooking all put together in one decadent bite. So be prepared to get those hands right into the mixture and start making some scrumptious little bits of heaven. 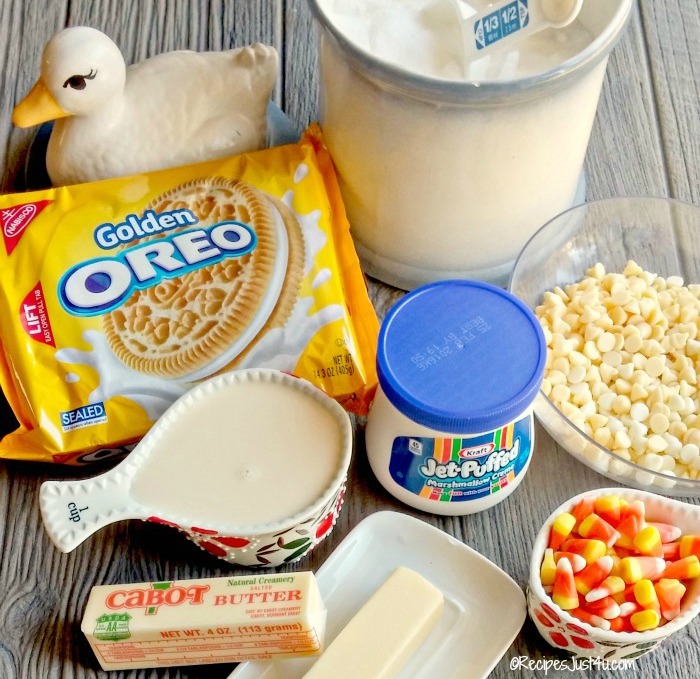 The first step is to combine 4 tbsp of butter with 20 Golden Oreo cookies and 1/3 cup of candy corn in a food processor. 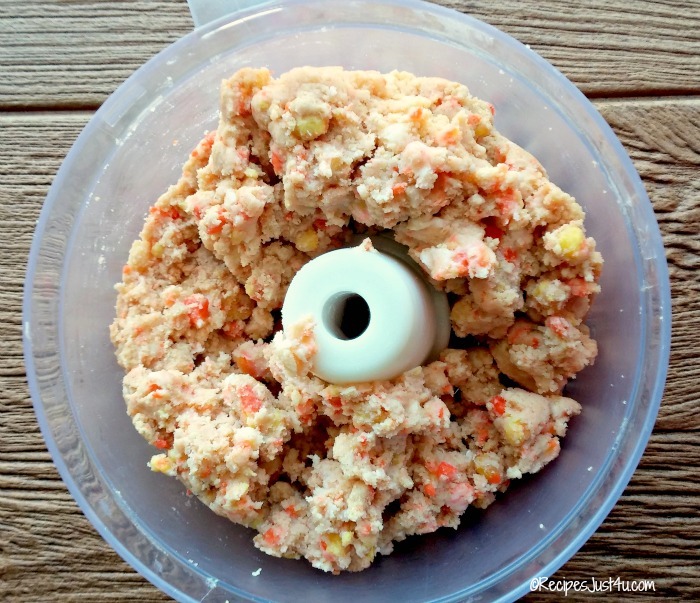 I use my food processor all the time in the fall. 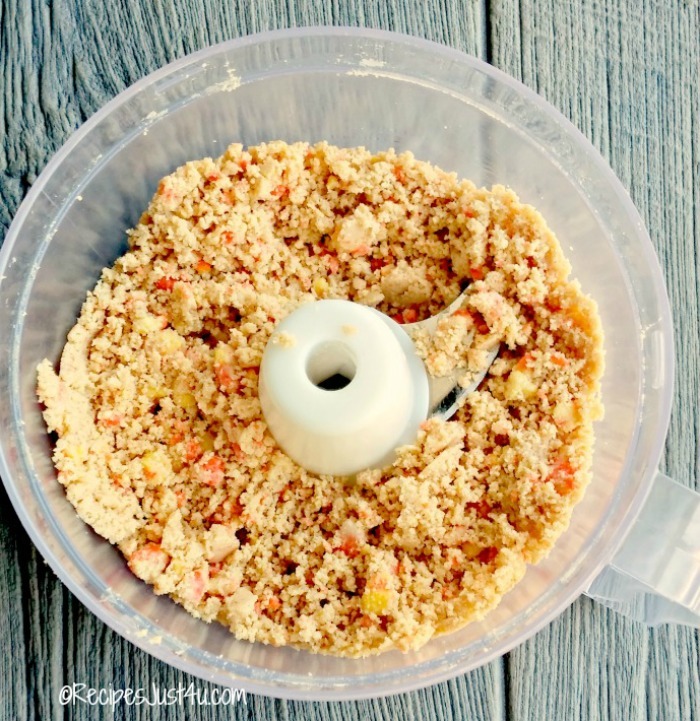 It makes crumbs for truffles and crumbles so quickly and is easy to clean, as well. Pulse the mixture until it is nice and crumbly. Combine the white chocolate and marshmallow fluff in a bowl and set aside, then cook together some sugar, evaporated milk, and butter for 3 minutes, stirring the whole time. Add the cooked mixture to the chocolate and fluff mix. Roughly chop up another 4 cookies and the remainder of the candy corn. Add them to the soft mixture and combine well.Place this in the fridge until it is firm but not completely set. When it is cooled, add it to the crumb mixture and pulse again. It will be the consistency of very thick cookie dough now. Grease your hands and shape the crumb mixture into 30 balls about 1 inch in size and set aside on a plate.. Now you will roll the balls into your choice of coating. I used shredded coconut, chocolate sprinkles and chopped pecans. These truffles are the perfect dessert bite. They have the consistency of a cake pop with the delicious taste of your most decadent truffle. They are perfect for both Halloween and Thanksgiving. Your holiday guests will love these. They are the perfect choice for those that want a sweet treat but are not fond of the sweetness of fudge. The Oreo cookies make them a bit more savory and the coatings take away from the heavy sweetness too. These are a keeper! 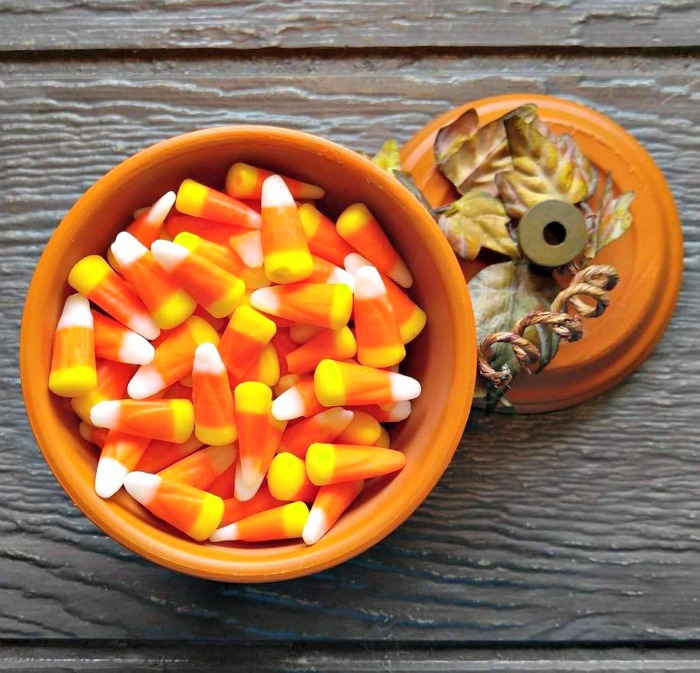 Have you used candy corn in your holiday cooking? Tell us about your recipes in the comments below! 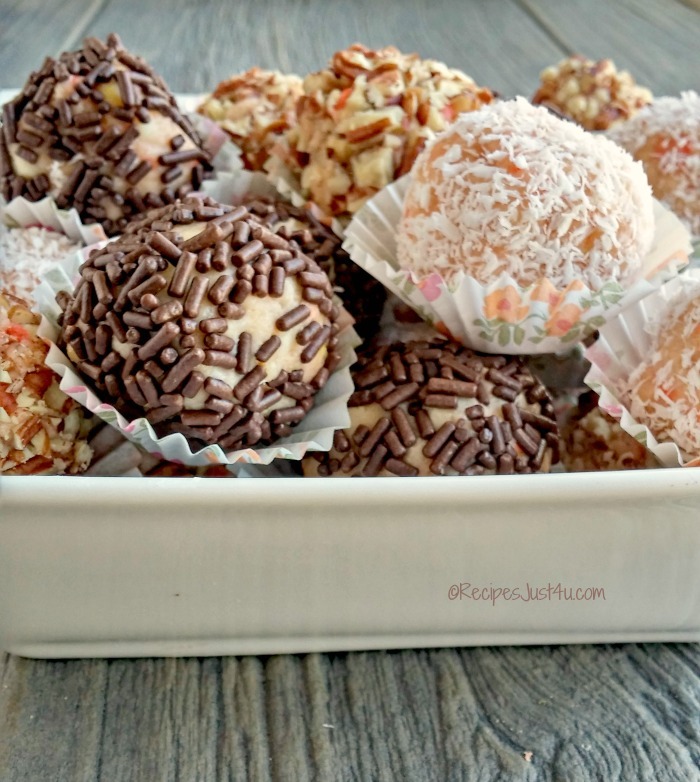 These candy corn truffles have about 157 calories each, so they are a once in a while treat, but so worth it! These candy corn truffles have a creamy center made from Golden Oreos combined with candy corn. They are coated with chopped pecans, chocolate sprinkles or coconut for one delicious bite. Melt 1/4 cup of butter. Set aside. Combine 20 of the Oreo cookies (about 20 cookies and 1/3 cup candy corn in a food processor. Pulse until mixture is crumbly. Add the butter in the spout and pulse to combine well. Rough chop the remaining cookies and candy corn and set aside. In a large saucepan over medium-high heat; combine the sugar, 1/4 cups butter and the evaporated milk. Bring to a boil, stirring constantly. Once mixture comes to a boil, cook for 3 minutes. Remove from heat, stir in chocolate chips and marshmallow. Stir until mixture is smooth. Mix in the chopped Oreo’s and remaining candy corn. Pour this mixture into a greased pan and place in the fridge. Chill about an hour until it is almost set but not hard. When cooled, add it to the golden Oreo crumb mix. Pulse until well combined and then shape the mixture into 1 inch balls. Roll 1/3 of the balls in the coconut, 1/3 in the chocolate sprinkles and 1/3 in the chopped pecans. Makes 30 candy corn balls. Store in an airtight container in the fridge. Yes, want to make these but not sure why the amount of evaporated milk is left out of the recipe! A whole can?? How many ounces? Hi Mary Ann, I apologize for the confusion. 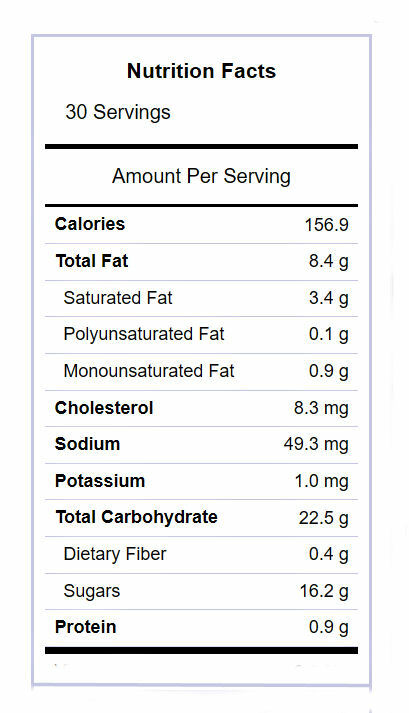 I showed the evaporated milk amount in one of the photos but neglected to mention it in the ingredient list. It’s one cup. Thanks for letting me know about the omission. Taking these to work. Yum. A good way to use up the candy corn!! i know i will love these! i love corn + they are just too cute! These are adorable and they look so easy. I bet my kids would love these. oh my..all i can say is super yummy! i think i would probably eat all of the ingredients. LOL. These treat look like they turned out great! It looks easy to make too. Thanks for sharing! 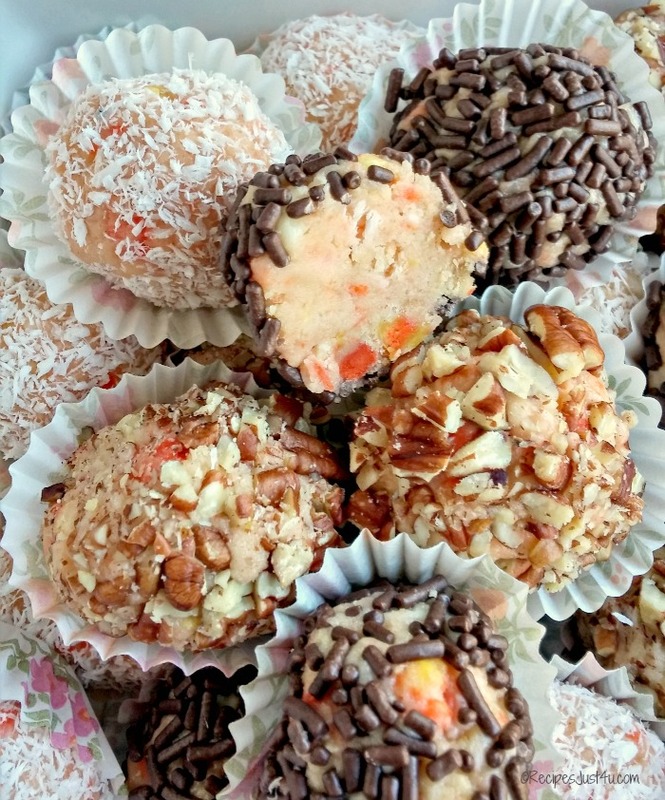 These Candy Corn Truffles look fabulous! My kids would go crazy for them. That I know for sure! These look so good – I can’t believe you made them! I feel like maybe I can even handle making them. I’ll need to give it a go! Super easy to do. I love making truffles. These truffles look irresistible. Thank you for the detailed instructions as I want to make them for my next dinner party. Your guests will love them! You can’t get much easier than these, can you? And more delicious, no way! I can’t WAIT to have some. Hope you like them Liz! What a variety of yummy treats Perfect for the fall season and parties. Golden Oreos are always a fave of mine. I’ve never used them until this recipe. Love the way they turned out. It’s such a fun time of the year for cooking. Those look really good. I hope to be able to make these this upcoming week. Yum. Hope they turn out well Bonnie. What a great idea to use up some candy corn. These all look so tasty and easy to make. They really are good. My husband loves them all. These truffles look incredibly delicious! I love that they have candy corn in them! Gotta try these! My husband is not much of a candy person, but he loves these. Thanks! It’s a passion of mine. Cooking with children is a lot of fun! Yeah candy or cookies don’t agree with my hips either. But I am in love with what you made! Yum! These seem like the best treat ever! Moderation is my key. As long as I don’t much on them all day, I’m fine. Just one as a little treat after dinner. I’m so going to make these tomorrow! I love the different toppings. I think it would be so much fun to have my kids in the kitchen helping me. Cooking with children is such a special time. They will love rolling them in the toppings. Me too. I love to make sweet treats during the year.